A woman applying liquid mascara to her eyelashes. Liquid mascara is a type of eye makeup used to accentuate the appearance of the eyelashes. It is available in a wide variety of colors and styles, to create a signature look that is unique to the wearer. This product may be found in local beauty and drugstores. This product is typically applied directly to the eye lashes using a curved wand. The small wand is housed in a tube like packaging that is filled with the liquid mascara. The end of the wand is similar in appearance to a small, round hair brush. This design makes it possible for the brush to separate and coat individual lashes. The wearer may hold the eye open or keep it closed while applying the product. Gentle, outward and upward strokes are used to draw the lashes out and away from the eye. Black, brown, blue, green, and purple are among the many colors in which liquid mascara may be purchased. Professional makeup artists often recommend that individuals choose the color of their mascara based on their eye color and natural hair color. A person with blonde hair and light blue eyes, for example, may benefit from using a brown tinged mascara, rather than a black mascara, so that the eye is highlighted attractively without calling undue attention to the fact that the person is wearing makeup. Someone with dark hair and dark eyes may prefer a black or dark blue mascara for a dramatic effect that blends well with their features. The color of the mascara may be chosen to accentuate the color of eye shadow being worn, as well. 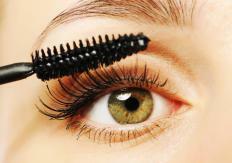 Some types of liquid mascara are designed to improve the natural quality of the eyelashes. The product can be engineered to make the lashes appear longer or fuller, and in some styles can also be found in a waterproof variety. These enhancements are often preferred by individuals with light colored or thin lashes who wish to improve the overall appearance and drama of their eyes. Those with allergies to topical creams and dyes may prefer the hypoallergenic mascaras which are available from a select few manufacturers. Liquid mascara often requires specialized eye makeup remover to take it off at the end of the day. This type of wash is different from standard face wash in that it is formulated to specifically target the heavy binding agents used in the mascara while remaining gentle to the eyes. Using traditional washes to remove eye makeup can leave remnants of the product behind which can create small, dark circling beneath the eyes in the morning when left overnight. What Are the Different Mascara Colors? How do I Choose the Best Liquid Eyeliner? What are Some Makeup Tricks to Make the Eyes Appear Larger?